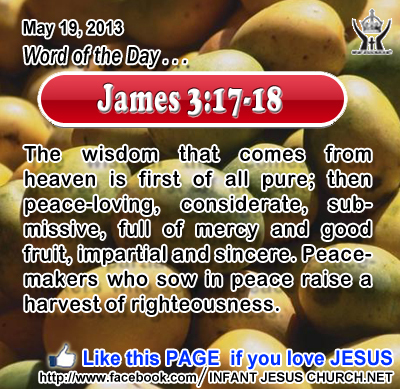 James 3:17-18 The wisdom that comes from heaven is first of all pure; then peace-loving, considerate, submissive, full of mercy and good fruit, impartial and sincere. Peacemakers who sow in peace raise a harvest of righteousness. Heavenly Father, thank you for signifying purity, peacemaking, deliberation, submissiveness, mercy, good fruit, impartiality, and sincerity in Jesus. On this Pentecost Sunday we ask for the power of the Holy Spirit and the courage to show these qualities this week as we seek to live like him. In Infant Jesus name we pray. Amen. 19On the evening of that day, the first day of the week, the doors being shut where the disciples were, for fear of the Jews, Jesus came and stood among them and said to them, "Peace be with you." 20 When he had said this, he showed them his hands and his side. Then the disciples were glad when they saw the Lord. 21 Jesus said to them again, "Peace be with you. As the Father has sent me, even so I send you." 22 And when he had said this, he breathed on them, and said to them, "Receive the Holy Spirit. 23 If you forgive the sins of any, they are forgiven; if you retain the sins of any, they are retained." On this Pentecost Sunday, Jesus offers each one of us the gift and power of his Holy Spirit. He wants to make our faith strong, give us hope that endures, and a love that never grows cold. He never refuses to give his Spirit to those who ask with hopeful faith. Jesus instructed his disciples to ask self-assuredly for the gift of the Spirit: “If you then, who are evil, know how to give good gifts to your children, how much more will the heavenly Father give the Holy Spirit to those who ask him!” Do we thirst for God and for the plentiful life he offers through the gift of his Spirit? Loving Infant Jesus, we thank you for the gift of Pentecost and for the new life you offer in the Holy Spirit. Fill us with your Holy Spirit and set our heart burning with the fire of your love that we may serve you in joy and freedom.